Researchers at the University of South Florida studying Alzheimer-like symptoms in mice found that a daily dose of 500mg of caffeine reversed the memory problems the mice experienced. 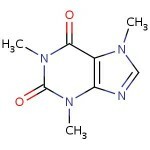 After two months on 500mg of caffeine a day, the memory-impaired mice performed as well on memory tests as normal mice. This suggest that caffeine will not increase memory performance above normal levels. Rather, it appears to benefit those destined to develop Alzheimer’s disease. Back in September, the BBC reported on a study finding that daily caffeine consumption was linked to a risk reduction for Alzheimer’s. Of course the actual study was conducted on rabbits who were fed a fat-rich diet with an experimental group receiving caffeine. The study’s authors suggests that caffeine blocks cholesterol which otherwises tends to make the brain/blood barrier “leaky” over time. “Caffeine appears to block several of the disruptive effects of cholesterol that make the blood-brain barrier leaky,” said Dr Jonathan Geiger, who led the study. “High levels of cholesterol are a risk factor for Alzheimer’s disease, perhaps by compromising the protective nature of the blood brain barrier. A spokesman for the Alzheimer’s Society said that the barrier seemed to work less efficiently in people who went on to develop Alzheimer’s or suffer strokes, and the cholesterol link might explain this. Researchers at the Gladstone Institute of Neurological Disease recently published their research showing that removing a protein-regulating enzyme from mice suppressed Alzheimer’s symptoms in an animal model of the disease. The researchers created genetically modified mice that expressed different levels of an enzyme known as Fyn. Fyn regulates the activities of many proteins. With Alzheimer’s disease, amyloid proteins accumulate in the brain and destroy synapses. In mice genetically engineered to completely block Fyn, however, the amyloid proteins were unable to damage the synapses and the mice lived much longer than typical mice used in the Alzheimer’s disease model. Our results suggest that Fyn lays a key role in Alzheimer’s-related synaptic impairments, and that it can worsen the toxicity of amyloid proteins. We are excited about the possibility that pharmacological modulation of Fyn might be of therapeutic benefit in this disease. As Fyn plays a key role in a number of neurological processes, it is unlikely that it could be completely suppressed in human beings without severe side effects. The researchers plan to conduct further research to quantify what sort of benefit, if any, mice in the Alzheimer’s model receive from partial suppression of the enzyme. Alzheimer’s pathology reduces, longevity improved in mouse model, Gladstone study shows. Press Release, University of California – San Francisco, May 19, 2004. Researchers at the Oregon Health & Science University recently announced they had identified a set of genes that are believed to play a role in the early development of Alzheimer’s disease. Through studying a mouse model of Alzheimer’s, the research team found that a series of genes related to mitochondrial metabolism in brain cells were more active than in normal mice. Mitochondria are structures located in the cytoplasm of cells that produce energy for the cell. Prior research has linked Alzheimer’s to mitochondrial function. However this is the first time genes that are responsible for early cellular change in Alzheimer’s disease pathogenesis have been identified. We studied gene expression levels at three distinct stages of disease progression in the genetically-altered mice relative to age-matched wild-type normal mice. We conducted gene expression analysis long before (2 months of age), immediately before (5 months) and after (18 months) the appearance of beta amyloid plaques. In doing this, we found that these mitochondrial genes were more active at 2 months of age when compared to normal mice, and in some cases their activity heightened as the disease progressed. We believe the abnormal gene expression comes in response to beta amyloid-induced mitochondrial dysfunction, even in its early stages. Based on prior research, it’s thought that energy metabolism in mitochondria is impaired by heightened levels of beta amyloid in the brain. We believe the genes identified in our study increase their activity to compensate for this damage, but unfortunately in the end they cannot keep up with the progression of Alzheimer’s. A companion study published in NeuroMolecular Medicine finds similar gene expressions in human Alzheimer’s patients, demonstrating the value of using a mouse model to study Alzheimer’s and, using this new finding, hopefully one day developing a test to detect the onset of Alzheimer’s early in the disease’s development. OHSU researchers uncover genes involved in early stages of Alzheimer’s disease. Press Release, Oregon Health & Science University, April 27, 2004. Researchers at the National Institute of Neurological Disorders and Stroke published an article in Science in December 2000 reporting on a very surprising finding — bone marrow injected into mice were able to transform themselves into brain cells. Bone marrow consists of a couple of different types of stem cells which are the source of blood cells in the body. Scientists knew that neural stem cells can transform themselves into muscle, but the accidental discovery that bone marrow stem cells can transform into neurons was a major surprise. In fact the researchers weren’t even investigating that possibility in their initial experiments. They had injected mice with a genetically altered form of bone marrow that contained a gene that made the stem cells glow in the dark. The researchers were investigating whether or not the stem cells would convert themselves to muscle cells in the mice. When they performed the dissection of the mice, however, they were surprised to find the animals’ brains contained neurons that now glowed in the dark. Several other experiments, some involving a second laboratory, were done to confirm that in fact the bone marrow was replacing neurons. Helen M. Blau, senior author of the Science article, told the Associated Press that, “It may be a repair mechanism that is going all the time at a low level.” The bone marrow probably doesn’t work at a high enough level to repair serious brain damage or disease, but it may be on ongoing way that the body replace dying or defective neurons. A lot more research will need to be done to better understand what is going on here, and this may never lead directly to any treatment for neurological disorders, but it does add an important piece of the puzzle on how adult stem cells can differentiate into a wide variety of other cells which is of great importance in many current efforts to find treatments for Alzheimer’s, spinal cord injuries, and a whole host of other ailments. Mice marrow can net neurons. Associated Press, December 1, 2000.